Aggressive Dog Training Buffalo NY – Change is Possible! If your dog is aggressive, your daily life might be completely out of control, full of anxiety and fear. Colonial Dog Training Buffalo NY can help your dog overcome their aggression problems, giving you and your dog your happy lives back! 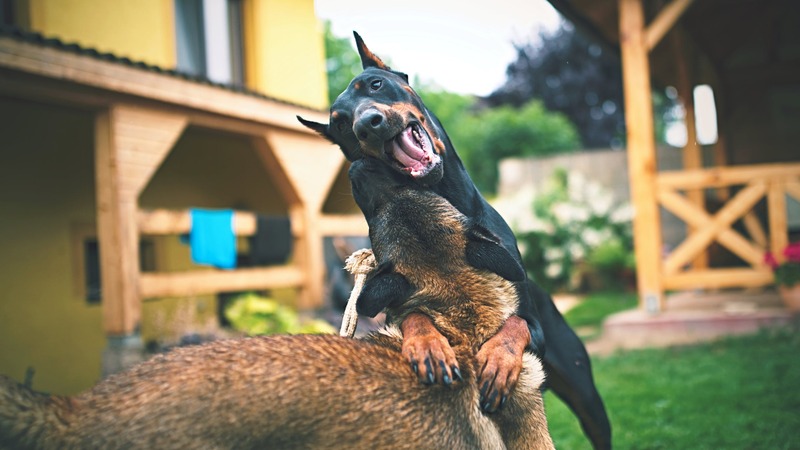 Whether the cause is due to a traumatic experience or from persistent dominant behavior during their puppy years, your dog CAN overcome aggression with enough time, effort and consistency! Our trainer, Danielle Jackson, has worked with and successfully rehabilitated hundreds of canine aggression cases in the Buffalo area. Many of these cases were dogs that were at the end of their rope, edging closer and closer to being surrendered back to the shelter, or even euthanized. No matter how hopeless your dog’s aggression may seem, change IS possible and Danielle is ready to help, no matter how severe the aggression is! No Dog Is Beyond Hope! No matter what type of aggression your dog may be exhibiting, Colonial Dog Training can help! With our aggression cases, we follow through with our routine reward-based training that is specifically customized based on the client and the dog. Dogs that show aggressive tendencies often are suffering from other issues, such as anxiety, fear, or extreme dominance. We want to make sure that we cover all the bases so that the dog not only discontinues biting, snapping, growling or lunging, but also so that any existing anxiety is removed. While we will eliminate the aggressive behavior patterns, our job would not be complete if the dog was still unhappy and stressed out all the time! For owners with aggressive dogs, all you need is to consistently communicate with your dog and have the right tools. Colonial Dog Training can be that tool for you and your dog. Even if your dog’s aggression seems mild, don’t wait for it to escalate! People think that dogs will eventually figure it out and “grow out of it”…don’t take this risk of setting your dog up for a lifetime of anxiety and aggression! In-Home Training that Gets Results! Our aggressive dog rehabilitation program will begin with a mandatory in-home consultation so that we may completely understand what it is you and your dog need in order to succeed. If after reviewing our training plan, you do not wish to move forward, you are under no obligation to continue with us. Once we create a training regimen specifically based on your training goals, we will then work toward giving you the knowledge and leadership to help your dog combat their aggression. Through this, your dog will learn to follow your lead, even among the most difficult triggers! Don’t wait for your dog to bite the mailman or your neighbor’s dog – call us at 716.217.2817 and we’ll enlist your dog in our aggressive rehabilitation training program. If there are any questions or concerns, you can also e-mail us through our contact form. Your dog does not have to be another surrender to the county shelter. Aggression does not have to be a death sentence for your dog. Change is possible and Colonial Dog Training is ready to bring you results!